I have to take down the Christmas tree and clean today. So I do not have to worry about “what’s for dinner”, I decided to make it a Crock Pot Saturday. I have had this recipe in the hopper for a while and have wanted to try it. 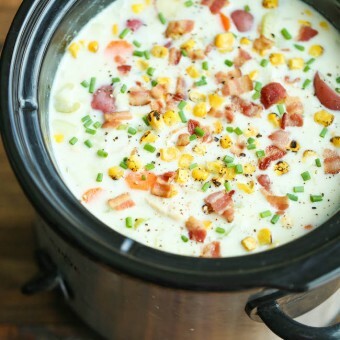 So, Chicken and Corn Chowder is what’s for dinner. Original recipe below and my changes in red along with it. I put the crockpot portion on at 10:00 AM. I will wait until the end to make the bacon (as I do not have any in the fridge and must run to the Walmart to get it (along with chives and corn starch). Cooking now, tree coming down. I will update this with results prior to publishing… I LOVE the smell of slow cooker food in my house… I will include pics at completion. I ended up not getting bacon. It was fine without it. I had shredded cheese in the fridge, that was included in my bowl (Husband loves oyster crackers). I only had 2% milk, obviously it did not turn out as thick as a chowder (increased the amount of milk and cornstarch to no avail). End result was delish! I put various chili based spices but you could only taste a hint of it in the end. I liked, plenty of leftovers and will make again!